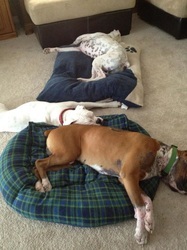 FINALLY - he is playing with his foster siblings! Bernard on his first hike with Cash & Cali. He did so good! He loved it! 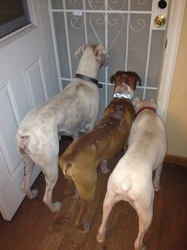 And did very well when he met other pups. I am SO PROUD to say that Bernard slept all night in our bedroom and not in his crate! 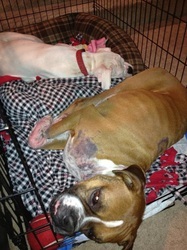 He slept between Cash & Cali and we are keeping our fingers crossed that he no longer needs his crate. I have seen him relax so much since I began fostering him not even 2 weeks ago! "BERNARD" in his foster home. 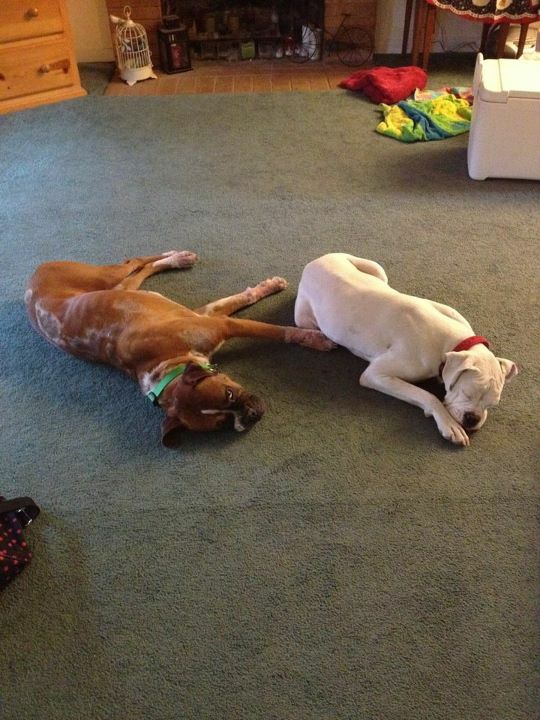 He is getting along well with the other dogs, and especially Cali likes to sleep with "Bernardie". 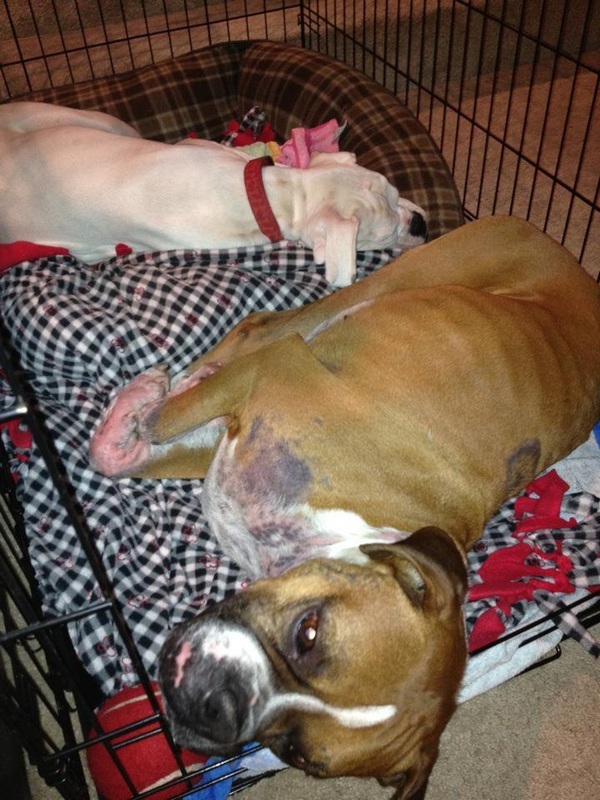 Thank you, Jennifer for giving our little mange boy the chance to heal in a loving home. THERE IS A GOD, and her name is Jennifer! Bernard is a lover and a very happy boy. Actually, he is a big flirt with volunteers and will kiss just about anyone who talks to him sweetly. Bernard turned on his charm, and volunteer Jennifer took him home today to foster. He also went for a walk today with several other SAR dogs, Trixie, Holly, and Paisley. Here are some pictures of Bernard making his move on volunteer Jamie. (he started with by putting his paw on her knee). Hospital in Hacienda Heights. He is looking and feeling so much better. Bernard had another sulfur-lime bath yesterday, along with daily shots of antibiotics and ivermectin. Fur is starting to come out where there was only scabs and bare skin. The abscess on his check is completely gone. He no longer has kennel cough. It is an amazing transformation from what he loked like, and what he must have felt like, almost 2 weeks ago. Dr. Shenouda and his staff took amazing care of this precious boy. 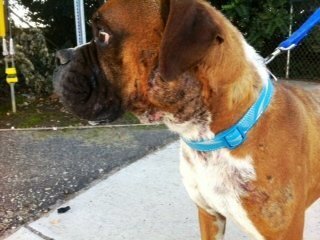 Bernard has made such great progress, he was discharged today, 3 days earlier than expected. Bernard is doing great! Here are some pictures of happy Bernard and his wonderful vet, Dr. Shenouda. cough is almost totally gone. 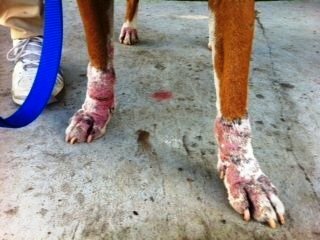 He is still red and swollen on his feet/paws from the mange but is no longer bleeding. Dr James expects that he will need to stay at the hospital for another week but Bernard is clearly feeling much better! I took him for a walk . He was excited to get outside to get some sun and a little exercise. I am also thrilled to report that I received my first kiss from Bernard. He's quite a good kisser! I saw Bernard today at St. Francis Animal Hospital in Hacienda Heights. Dr. James and his staff are taking great care of him. He is already doing much better. an infected laceration. The area was thoroughly cleaned and drained. The swelling is still there but is much smaller. He is still coughing due to kennel cough, but that also is better. Bernard was so happy to see me, Dr James, and Jasmine (vet tech) today! 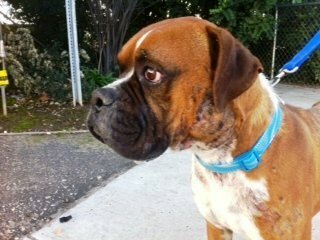 This boy is amazing...he doesn't care that he's had a tough life, has sores over his body, an infected cheek, and feels horrible, he is thrilled to get some love and attention. Bernard is a great dog, beautiful on the inside. Once he's healthy, he will be gorgeous on the outside. Please keep Bernard in your thoughts and prayers, and that his progress continues. Sachi will keep everyone posted. Here are some pictures from today. They aren't good, but we'll get some better ones in the next few days. Bernard is at St. Francis Animal Hospital. Dr. Sam examined him today and recommended he stay at the hospital for treatment for the next two weeks. 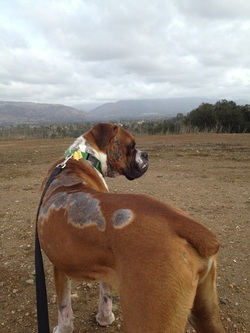 Bernard definitely has a bad case of demodex mange (not the contagious type). He was giv...en his first lime sulfur dip today. Bernard is weak so he is on IV with anti-biotics. He will undergo surgery tomorrow to deal with the abscess in his left cheek, and since he will be under, he will be neutered at the same time. 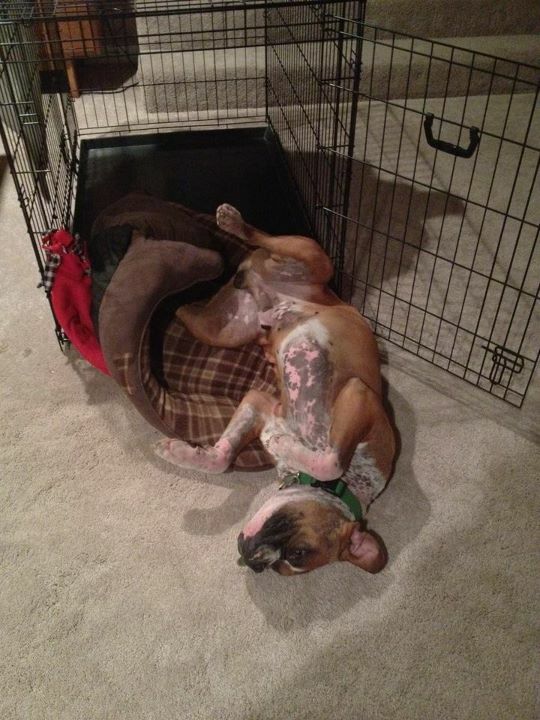 He does have kennel cough, but mild relative to his other issues. Bernard has a lot of healing to do. He is a young boy with a long life a head of him. Please keep him in your thoughts and prayers. yesterday New Year's Eve at the Bakersfield shelter. The shelter was closed for New Year's Eve but the wonderful workers at Bakersfield let us in. We saw Bernard and knew we had to save him. 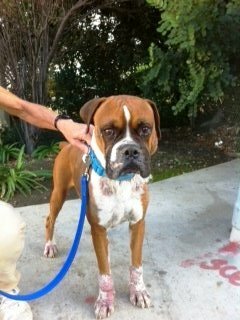 Bernard's last day was New Years day, and the shelter was closed. He wasn't going to be adopted. Bernard is a beautiful flashy fawn boy, only 2 years old. 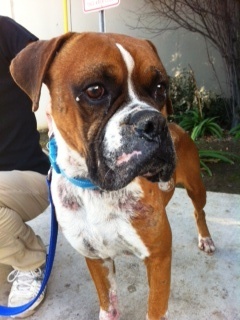 Bernard was found in the Bakersfield area as a stray, with mange (demodex, not contagious) and an abscess on his check. 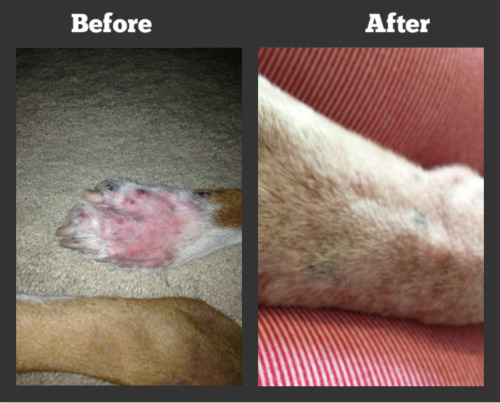 His paws are raw,red, bleeding and swollen. Now he has also has kennel cough. Despite the pain and discomfort Bernie is in, he is an absolute sweetheart. 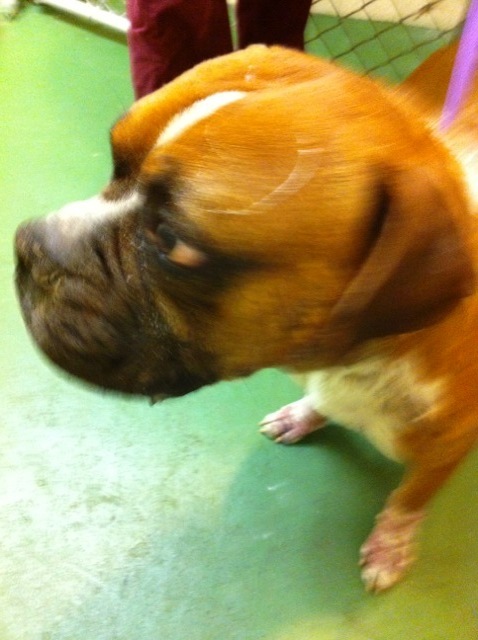 His little stub wagged like mad when he met us and volunteers at the kennel. He is grateful to be alive and to be getting some attention. Bernard was dealt a really bad set of cards. 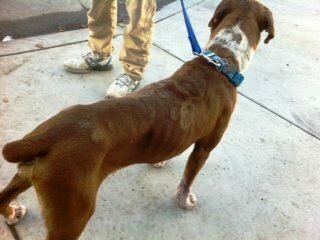 His previous owners didn't care about him enough to take him to the vet (mange does not appear overnight and is easily treatable). Then they just dumped him somewhere, to live of the land, to get hit by a car, or to be attacked by coyotes. We have to make it right for Bernard. He, and no other dog, deserves this. He will be taken to the vet on Monday for full exam and treatment. 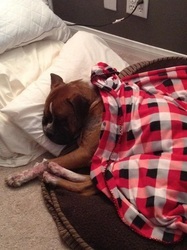 Sachi needs donations to help with the medical costs of Bernard. 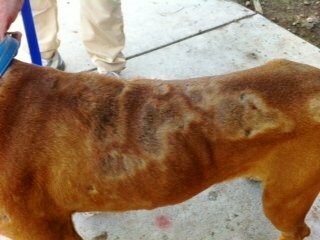 We are estimating around $500 for cost of treatment. 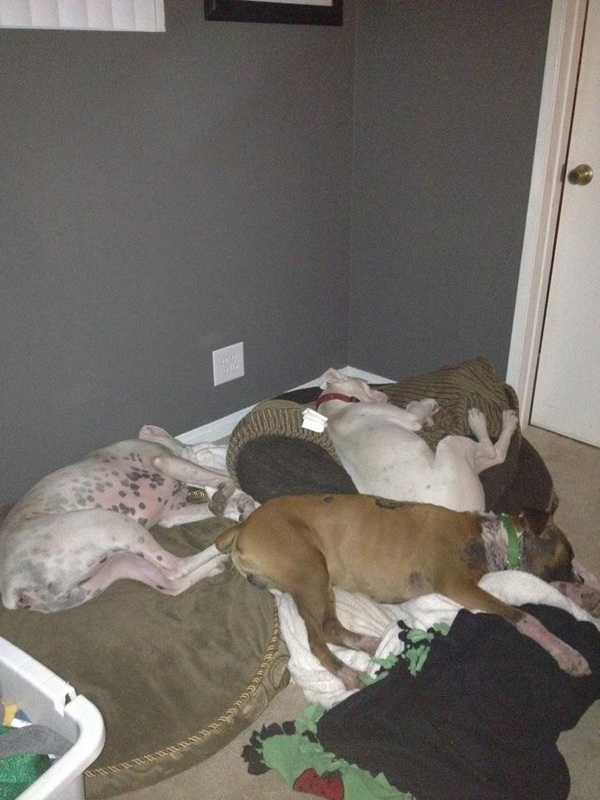 Please donate toward Bernard by PayPal or check, noting that it should go towards Bernard. 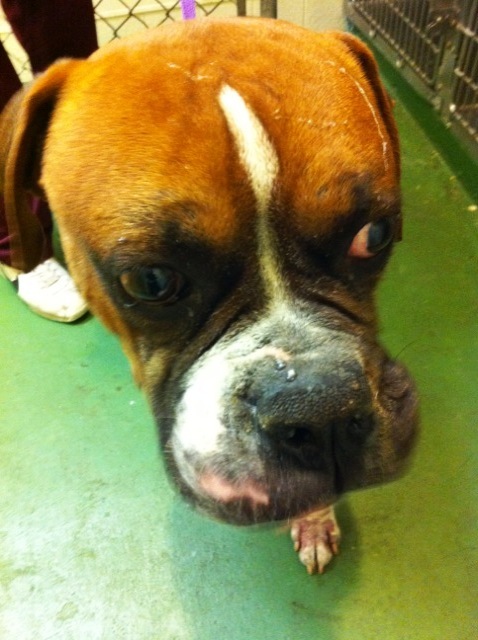 We would also like to have a foster home for this poor boy. He needs a lot of TLC.